We reviewed the Land Rover Discovery Sport last year. Early models were powered by an ageing 2.2-litre diesel engine, but that unit has been replaced by a 2.0-litre with improved fuel economy. With its new engine, the Land Rover Discovery Sport won its class at the Tow Car Awards 2016. Now we’ve spent more time behind the wheel. So let’s find out how good the Discovery Sport is as an everyday drive, in addition to what tow car ability it has. While big improvements in economy and emissions are the most obvious benefits of the new engine, these have done the Discovery Sport’s towing credentials no harm at all. Peak power has dropped from 187bhp to 178bhp, but torque is more important when towing. The 2.0 TD4 delivers 317lb ft from 1750rpm. That’s 7lb ft more than the old engine produced. For matching purposes, there’s little difference in the weight of the Land Rover Discovery Sport with the new 2.0-litre engine. The updated model has a kerbweight of 1884kg, giving an 85% match figure of 1601kg. The legal towing limit (2200kg) and towball limit (100kg) are unchanged. We matched the Land Rover to a Swift Elegance 570 with a Mass in Running Order of 1561kg, an 83% match. 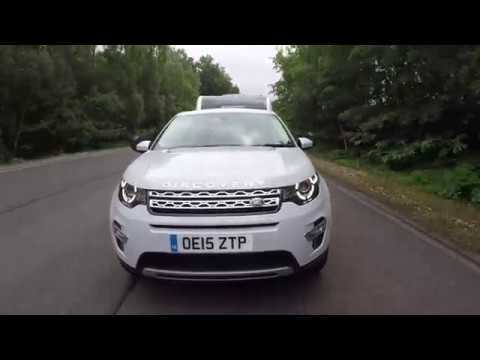 The Discovery Sport easily held speed on steep hills with enough power in reserve for confident overtaking. You can buy quicker and more powerful cars for similar money, but we found the Land Rover to be fast enough. Besides, stability rather than speed has to be the top priority when towing, and the Discovery Sport is a very stable car indeed. At motorway speeds, it feels unshakeable. It easily handled the lane-change test, too. Only when really pushed could we feel the caravan beginning to tug at the back of the Discovery Sport, which always pulled the Swift straight again. The 1-in-10 slope at our regular test track proved no trouble for the Discovery Sport – no surprise there, because it tackled the 1-in-6 test hill at the Tow Car Awards test track with ease, too. Suffice to say we love towing with the Land Rover Discovery Sport. The changes under the bonnet also pay off in solo driving. While the old engine was gruff, the new one is much quieter and more subdued. Other than an abrupt start-stop system, which sends a shudder through the cabin when the engine restarts, the Discovery Sport is now more refined, with wind and road noise kept in check at speed. However, the low-speed ride remains on the firm side. Anyone expecting the new Land Rover Discovery Sport to match the pillowy bump-absorption of the full-size Discovery will be disappointed. Nevertheless, head out of town onto country roads and the ride smooths out considerably, blending comfort and control. On twisting roads, the Sport leans more than a BMW X3, but the steering is precise and there’s plenty of grip. Land Rover has packed a remarkably generous interior into this relatively compact car. Rivals, including the Audi Q5 and BMW X3, only have five seats, while the Discovery Sport can boast seven. Even if you don’t need the third row, there are good reasons to choose the Land Rover over other prestige-badged mid-sized 4x4s. There’s lots of legroom in the middle row, and the generous width of the car allows three adults to sit on the centre bench in reasonable comfort. Up front, there’s plenty of room, and a comfortable driving position. Some of the plastics and trim would benefit from a more upmarket finish, though. With all seven seats upright the boot is small, but there’s lots of room for bags with the back row folded away. With the middle row stowed you get a healthy 1698-litre capacity. A price-tag of £43,400 isn’t cheap, but HSE Luxury spec is packed with standard kit. We’d be tempted to forgo some luxuries and choose the more affordable SE Tech car, which costs £36,350. Fuel bills should be lower with the 2.0-litre engine than the 2.2. Economy has improved from an official combined figure of 44.8mpg to 53.3mpg. Towing on a mixture of A-roads and motorways we saw 28mpg. Resale values are exceptionally strong; our colleagues on What Car? predict that the Land Rover will hold on to 54% of its original price after three years and 36,000 miles. The Land Rover Discovery Sport was always a very good tow car. It’s now even better. The new engine has fixed most of the flaws, and it’s as stable and practical as ever.